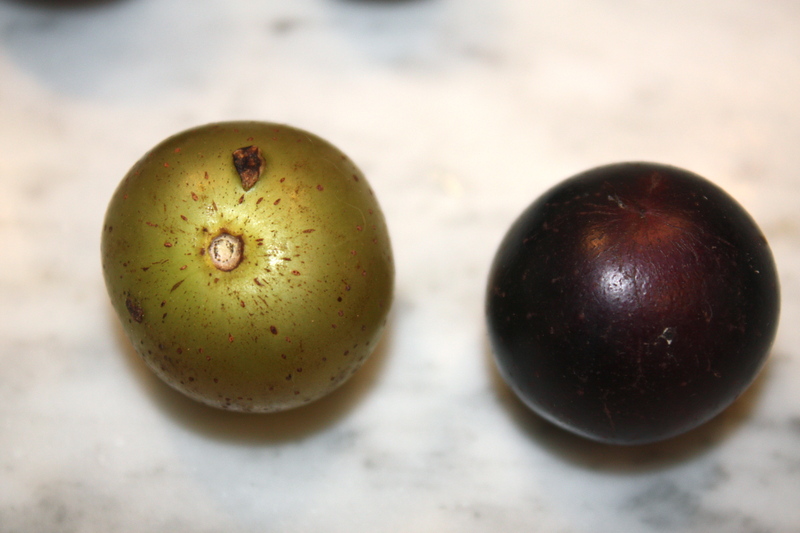 I came across Muscadine grapes at the farmer’s market a few weeks ago and was intrigued, as I had never seen or tasted before. I learned that they are native to states south of the Mason-Dixon Line and as far west as Texas and have valuable antioxidants and fiber. They are definitely different from your typical table grape, with thick, butter-like skins and seeds. 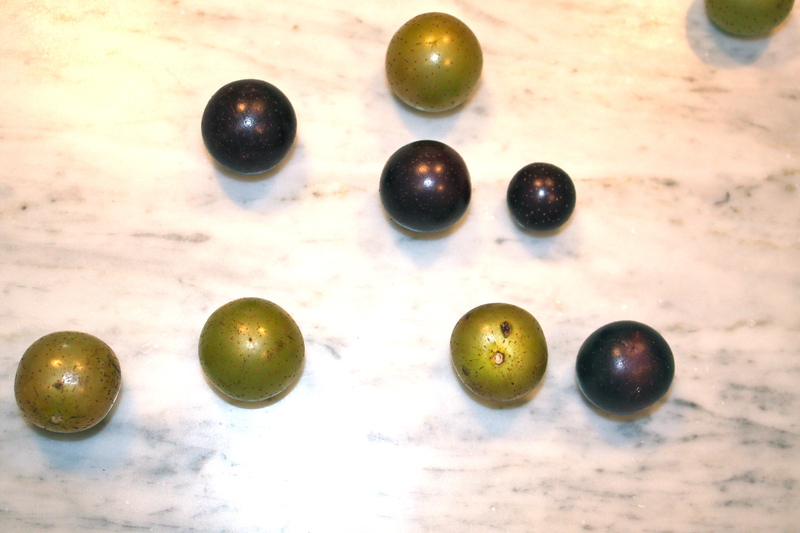 Muscadine grapes can be found locally at your farmers markets or farm stands from August to October. I was determined to make something with this I.O.W. (ingredient of the week), and since the skins have a slight bitterness, I decided to roast them off. This recipe came together quite nice. 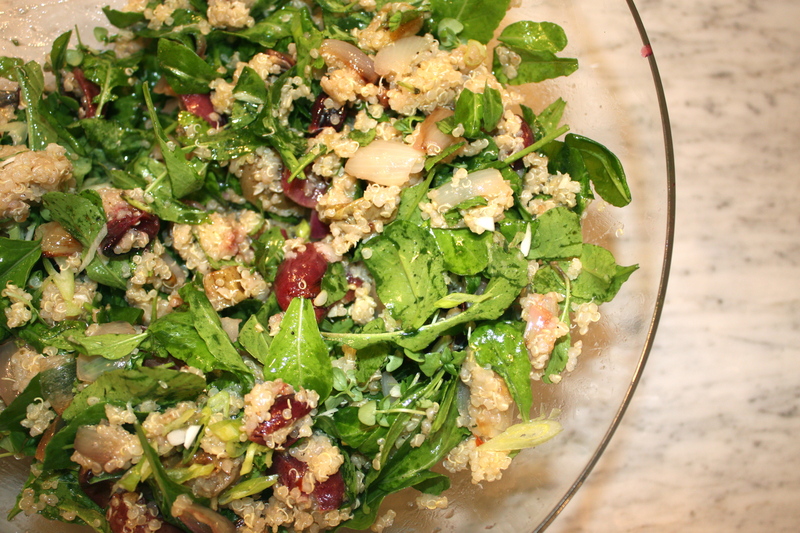 The roasted grapes and shallots sweetened while the peppery arugula gave the quinoa a great balance. You can also make this dish with regular grapes. To make the quinoa, toast 1 cup dry quinoa in the bottom of a saucepan for about a minute until it squeaks when stirred with a wooden spoon. Add in 2 cups of water. Bring to a bowl. Lower to a simmer. Add lid and simmer for 15 minutes. Take off the heat and sit for another 5. Fluff with fork. Set aside. Toss the shallots in a bowl with drizzle of olive oil and a little sea salt and freshly cracked black pepper. Place on a baking sheet and roast for about 10 minutes or so. Toss the grapes in the same bowl, again with olive oil and sea salt and black pepper, and add to shallot pan, cooking an additional 15 to 20 minutes, until shallots are browned and the grapes have just started to burst. To make the dressing, mix together the shallots, mustard and vinegar in a small bowl. Whisk in olive oil until it becomes emulsified. Season to taste with sea salt and black pepper. Set aside. In a medium to large skillet, heat a little olive oil on medium heat. Add the garlic and fresh oregano and saute for a minute or two until flavorful. Mix in about half of the quinoa along with the roasted shallots and grapes. Saute until warmed through. Take off the heat and toss in the arugula. Serve immediately with a little dressing and top with the toasted pumpkin seeds. How is it that no one has commented on this recipe by now? This is not a salad, it’s a perfect meal – thank you so much for posting it!